This past week started out with me being quite sick on Monday and Tuesday. After my family had been sick the week before, I knew that I was at higher risk for catching something, and boy did I. So I ended up staying home on Monday and Tuesday. On those days, students finished up chapter 3 about The Church and began chapter 4 about Town Life in the middle ages. I came back Wednesday and rewarded the students with a trip to the computer lab. In the lab, students updated their blogs by making a post that reflected on their Church Poems which were turned in on Monday. They also had a chance to trade stocks on http://www.howthemarketworks.com/ (by the way, some of the students are really having fun playing the market!). One of my main goals in the lab, however, was to introduce them to voicethread (click to watch a short demo), a web application that allows group conversations around images. To do that, I created a practice voicethread (click to see it) using one of the pictures from the textbook that shows town life in the middle ages. All of this was designed to prepare them to use voicethread as a way of reflecting on their church poems and provided feedback on their classmates' poems. On Thursday we were back in the classroom where I began teaching students about marking the text and using an abbreviated code in the margins. Specifically , we learned how to connect to prior knowledge and to pose questions as they read. I had to make a copy of a page in the text as I don't want students writing in the textbooks. This week, we may try placing a clear transparency sheet in the textbook and letting students write on that as they read so I don't have make copies of the text (which seems like somewhat of an overuse of paper). 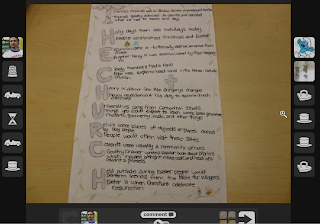 Finally, on Friday, I decided to go for it and let the students use voicethread to make comments on their church poems. You can view the voicethread here. This past Tuesday was also a 15 day progress update. Many students are still working with me to get their missing work turned in. But because I have also been out more than I'd like, it has been difficult to connect with every student. So, if a student is missing work from the previous three weeks or so, I am giving them more time to get that turned in. On the next progress report, however, I will be turning those missing assignments to zero's, at which time they will negatively impact the grade.